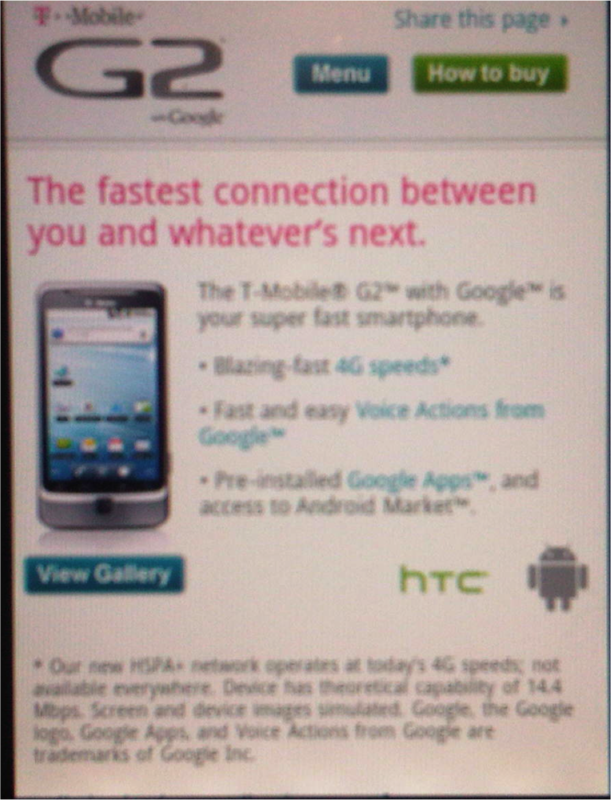 I just saw your ad in Fast Company. This one. You know, the one with the cool Microsoft Tag in the upper right-hand corner. I almost missed it. But I won’t hit you with best practices for these things. Being cute with them is neither here nor there. That’s not what this letter is about. I have to tell you – I’ve been watching these things over the last year and a half and I’ve seen some good ones and I’ve seen some bad ones. Not really codes. The content behind the codes. The thing that makes a complete experience. Generally, I like these codes. I think they’re really effective at driving a deeper brand engagement with your current and/or potential customers. And easy. That’s the great thing about them. Snap a picture, get a cool experience. On your own personal screen. Wherever you are. But I’m getting to the point to where I only like the idea of the codes. Because the execution of the experience has been disappointing. Not a big deal. There are far more things to be genuinely disappointed about. But you see, I’m a marketer, too. So, I appreciate good brand experiences. And that leads me to your ad. I see one of these codes on a Porsche ad and I automatically think that I’m going to get a Porsche-like experience. Luxury product, luxury experience, yes? 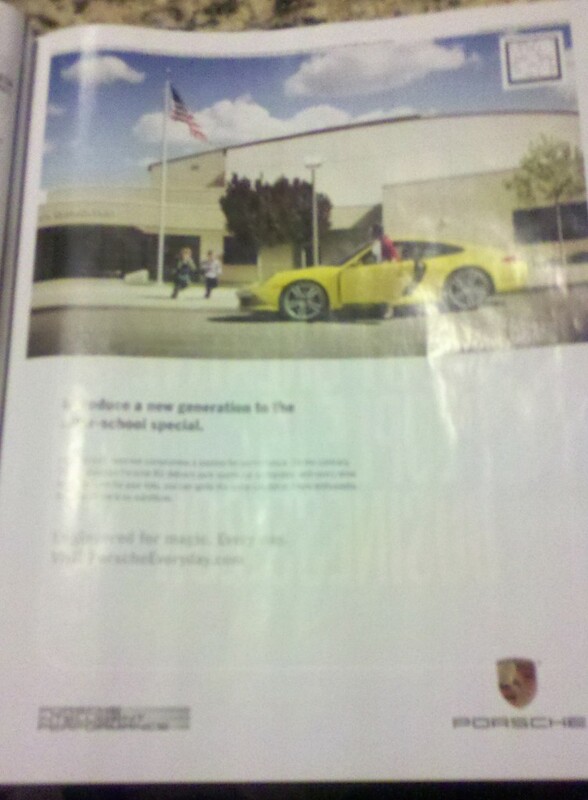 A 15 second video showing the “World’s Coolest School Bus” is a yellow Porsche? That’s it? Rarely do I say that I’ve wasted 15 seconds on anything. But this is the feeling you left me with. I know, I’ll probably never be able to buy one of your products (and quite honestly, will any of your true targets ever scan a tag like this? 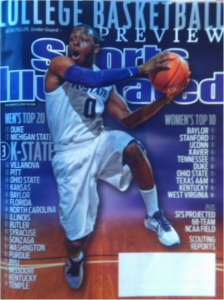 ), so my opinion probably doesn’t matter much at all. But for what your brand stands for, I would expect to get a killer 15 seconds. Instead, I got a dud. Using enabling technology like this can be fun and experimental, but I also think there’s such a thing as “on brand.” Regardless of the fun and experiments. I mean, Porsche should be Porsche-like in everything. Shouldn’t you? This entry was posted in Emerging Technology, Marketing, Mobile and tagged enabling technology, Mobile, MS Tags, Porsche on 06/30/2011 by Mike Cearley. As soon as I write a post on focusing on the basics– like setting clear expectations – when implementing QR Code (or other code-based) initiatives, it’s only natural that would find clear examples supporting the problem. Do you know what they have in common? The case of the cutesies. Like so many of the code-based implementations I’ve seen over the last year, they forget about one of the simplest best practices of getting a user to take action: provide a clear AND compelling call-to-action. It’s like this is sacrificed for the (seemlingly) sake of being cute. Cute design. Colorful. Mysterious. Shapely. As a consumer, I’m less likely to take action just by the “look” of the code. I want to know what I’m going to get, and more than that, I want to know if there’s anything unique in it for me once I do scan it. These calls-to-action are uninspiring, at best. And the kicker – absolutely nothing. I bet if you got 5 people together who best represent the “average consumer,” showed them these ads, and asked them if they knew what “it” (the code) was, at least half of them would say no. Then, once explained, they might say something like, “why would I do that?” And in this case, the answer would be for “more information” or “our activities” or “just because.” Sounds compelling right? Does that compel you to take action? As I said the other day, I think this question is a great filter when implementing any code-based campaign. And it’s simple. If the answer to that question – would this call-to-action compel me to take action? – is no, I’d highly recommend re-thinking a) the actual call-to-action and/or probably most importantly, b) the content “behind the code” (the content you offer up after scanning the code). Consumers don’t just want to know “how,” they want to know, “why.” Answer them both, and make it clear to the consumer, and you’ll have cracked half of the nut. 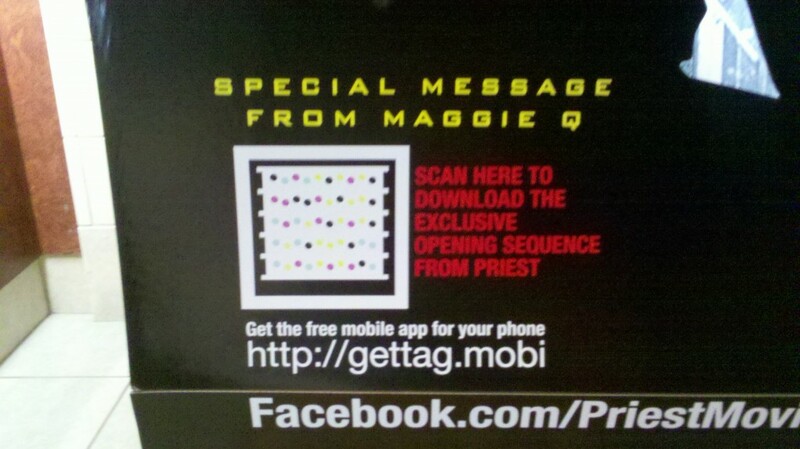 This entry was posted in Emerging Technology, Marketing, Mobile and tagged Mobile, MS Tags, QR Codes on 02/09/2011 by Mike Cearley. 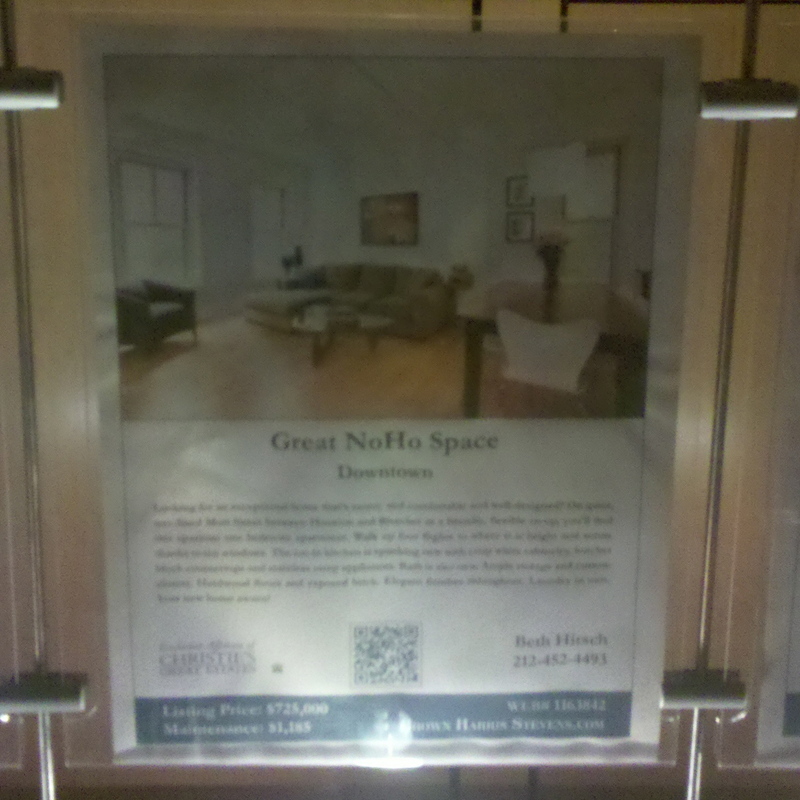 How Much Does (QR Code) Size Really Matter? 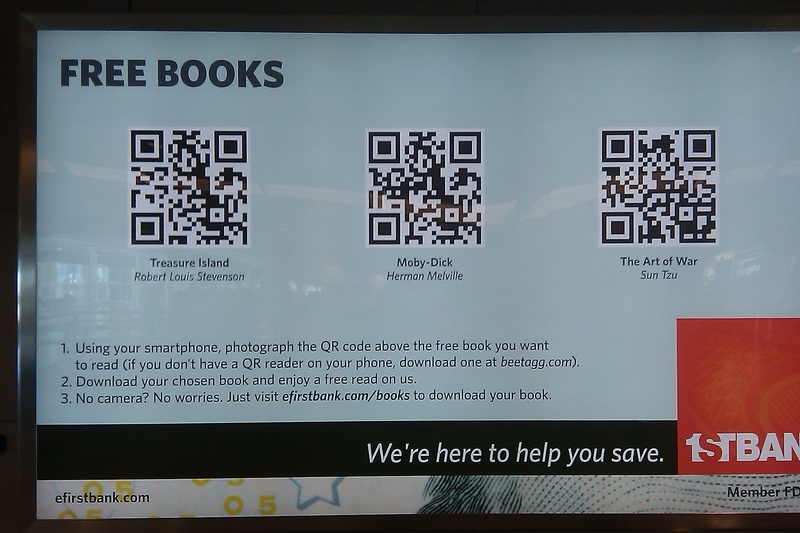 Common sense, expert opinion, and the most fundamental best practices would tell us, of course it matters – the size of QR codes (especially in public spaces) directly impacts how many people see it, therefore how many people end up scanning it. But I wonder how accurate that really is. 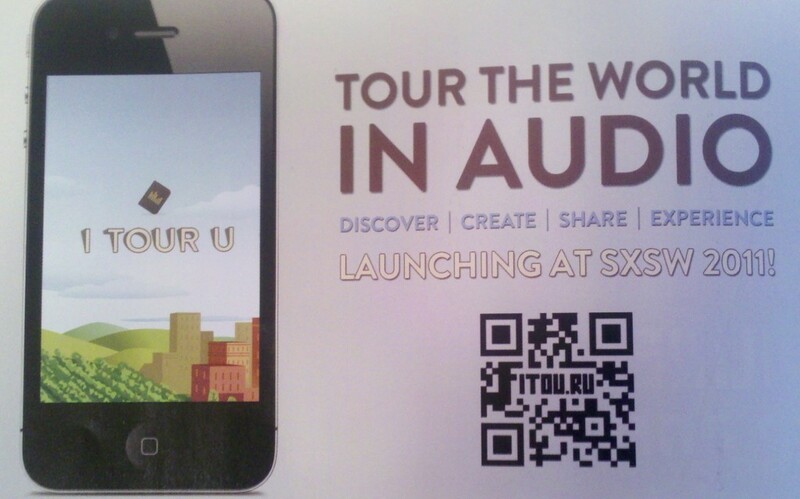 Recently, I saw this huge billboard in the Denver Airport with three large QR codes on it. Then, conversely, I saw another huge print advertisement in a mall here in Dallas with a tiny QR code on it. That’s it in the bottom left-hand corner. You might have to squint to see it. 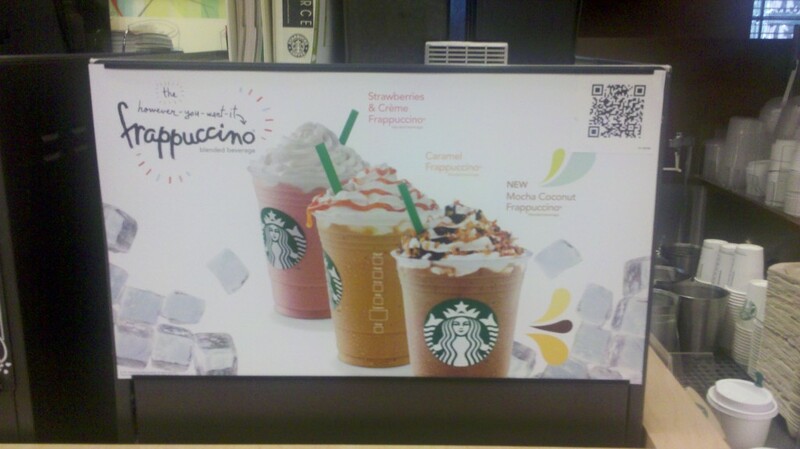 Both advertisements were large and placed in high traffic venues, in high traffic areas, so the chances for noticing them on a daily basis is high. But guess how many people I saw scanning either of them? Now, in fairness, I was only in the vicinity for a few minutes. But in those few minutes, it was as if I was the only one who not only noticed the ad, but was actually interacting with it. So, I think the size is a relevant question. 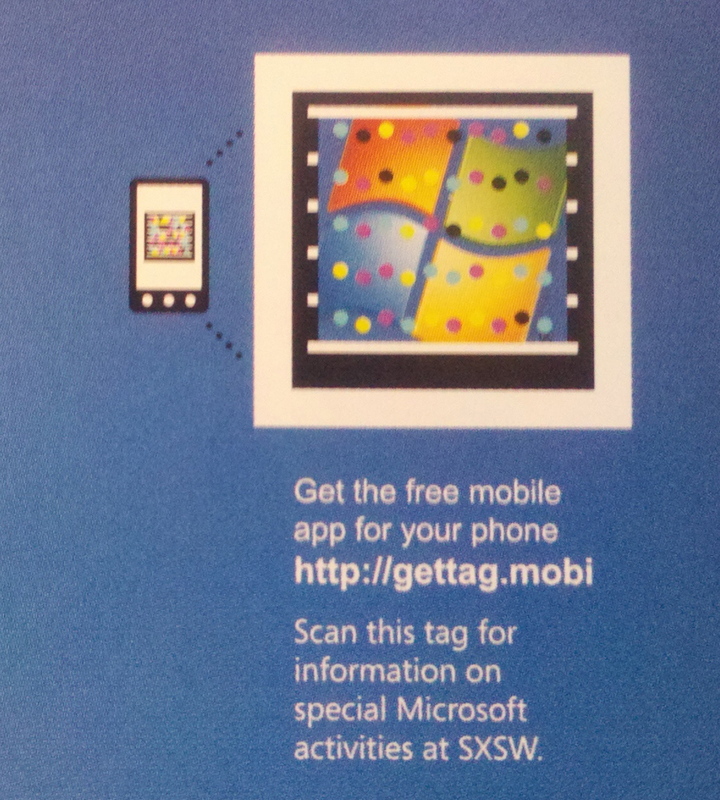 Because the real questions still remain – Do people even notice QR codes (or Microsoft Tags) when they see them? Do they know what they are? Or know what to do with them? I still don’t think the average person knows what they are or how to use them, so when they see them, they have no impact. Regardless of their size. Now prominence is another thing. As a marketer or brand who’s implementing these types of codes, you’re not giving yourself any chance of succeeding when you place a tiny code in the bottom corner of an ad, where only the wheel of a stroller would notice it. 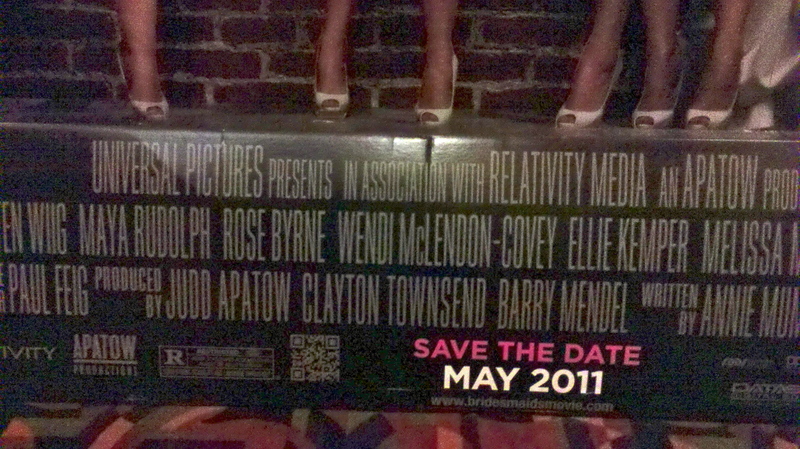 Be that as it may, I think brands/marketers have alot of flexibility in size and prominence. As long as it’s big enough and can be seen within a reasonable line of sight, I would say that you’ve covered the size and prominence aspects. But there are bigger issues to solve around these codes. I think the only way we can get the general person/consumer to become aware and adopt a new behavior (scanning these codes) is to add real value to the codes. “More information,” which seems to the “value” associated with most of the codes I’ve seen in the past year is not enough. There haven’t been many brands who have cracked this nut and as a result, probably not seeing the success they anticipated. 1. There is potential in using these codes and even more, the codes becoming commonplace in our world. If you haven’t seen the report, check it out. There are some solid examples of the wide range of uses with these codes. Another thing that stuck out to me in these examples were how the expectations (for scanning the code) were made clear from the outset. The pieces included language around the code that informed people what would happen/what they would get if they scanned it. And it wasn’t “more information.” Even when real-estate is limited, it’s essential that expectations – and more clear than not – are set. Enlist a good copywriter and I guarantee they’ll write something that’s clear and concise. That assumes, then, you’ve reasonably thought through basic elements like size and prominence and expectations. And you’re answering that question based on the “value” – be it content, offer or purchase – that you’re going to get. If you skimp on the value, it doesn’t matter if the code is a size of a building. No one will scan it. 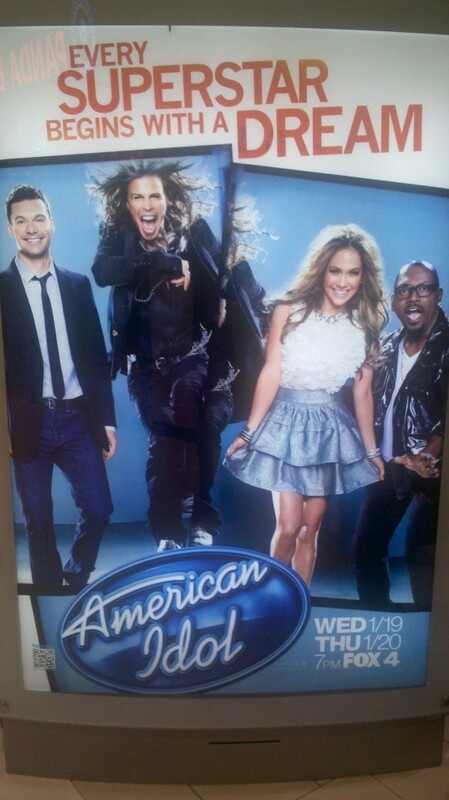 This entry was posted in Emerging Technology, Marketing, Mobile and tagged American Idol, Mobile, MS Tags, PSFK, QR Codes on 02/06/2011 by Mike Cearley. This is Part 2 in a multi-part series this week on Mobile Scanning Technologies. I think these types of technologies are powerful in the “new” OOH because they bridge the offline (real-world) with the online (virtual world). And the “new” OOH, to me, is all about connecting others with the places and things around them AND each other. Yesterday, I posed this fundamental question I’m often faced with when exploring two powerful enabling technologies – code & image recognition. Today, I’m going to share a couple examples I found in the latest edition of Wired. As if I was setting up the comparison myself, there they were, 2 different car companies, using 2 different types of technologies, in the same publication. In terms of industry and target, I couldn’t ask for a much closer sample from which to compare. 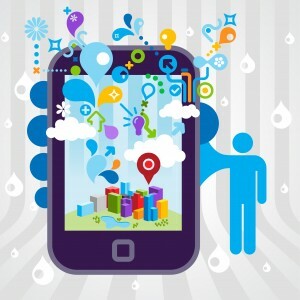 Both are factors in how “valuable” the technologies are in the brand experience. Right off the bat, I notice a benefit that addresses the main question yesterday – “why not use a URL instead of the code?” In the Ford ad, they use both. This is smart and a solid approach. The code takes you to an Edge-specific site and the URL takes you to a Ford-specific site. By including both, they’re a) able to offer up two different paths and b) something that can’t be overlooked, they’re not confusing the consumer by including two different URLs and/or two different codes. They each have a purpose. This is on top of the sheer value of making an otherwise non-interactive piece of collateral interactive. From a consumer’s standpoint, if they’re in the right mindset, this technology enables a unique, immersive experience from something that’s never generated an “experience.” And that’s a key differentiator here – the experience – you just don’t have the same experience typing in a URL on your mobile phone as you do scanning a code or an image. I would argue that in this day and age of consumption and connectedness, experiences are more and more important for brands to create. Those experiences can be created in many different ways, and one of them is through technologies like this. After the code/image is scanned, it’s important to pay off the experience with compelling content. This doesn’t mean that the content needs to be flashy or moving, it just needs to provide value. While the Ford Edge site offers more content, I would say both of these brands do a good job of providing the right content. “More” does not necessarily equate to “right,” but “right” equates to “valuable.” Regardless of where the consumer is in the purchase funnel, both of these sites give them enough information to get further down the path. For awareness – the sites give them basic information. For consideration – the sites give them access to a deeper level of information. For purchase – the sites give them the ability to connect with dealers. The debate can be had to whether or not Ford’s “more” content is more valuable than Buick’s scaled-back content, but the important thing to recognize here is that there is content for everyone. When looking at these two examples through this lense, I walk away with an important insight – it’s OK to present fewer options of content, just as long as they’re the right options. And the brand’s objectives will dictate that. So, I think that both of these brands bring value in their respective experiences. I don’t think that one does a better job than the other in using these technologies. 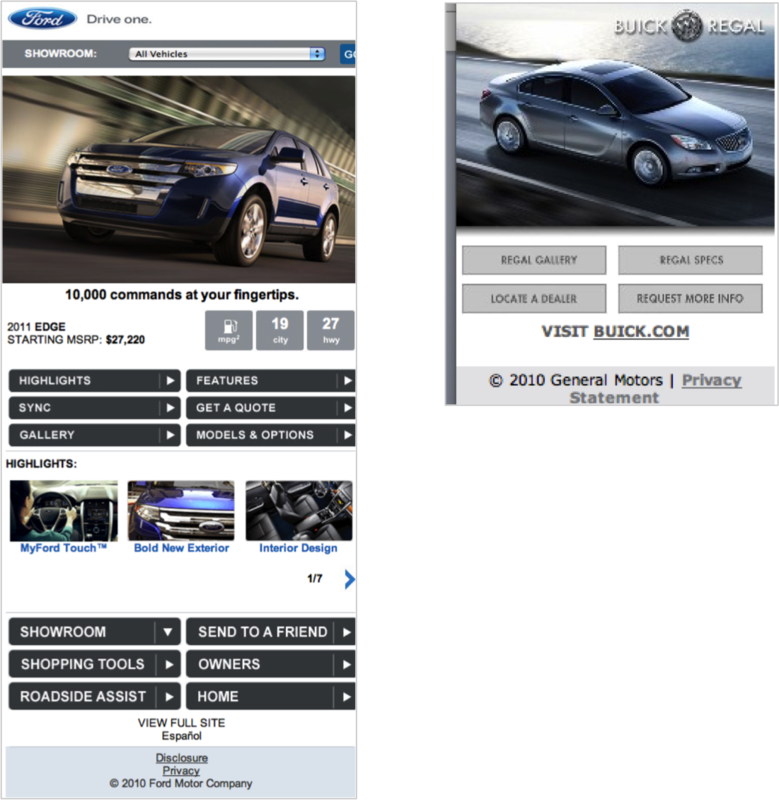 Ford has had more time to test this type of technology and content with their audience(s). But both provide a level of utility through a unique experience that wouldn’t otherwise be had. So I ask, what’s NOT valuable about that? 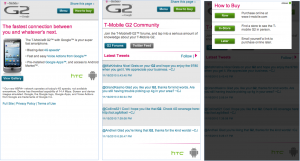 This entry was posted in Emerging Technology, Marketing, Mobile and tagged enabling technology, Google Goggles, Mobile, MS Tags on 12/07/2010 by Mike Cearley. 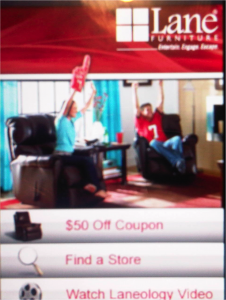 Thumbing through the latest Sports Illustrated (print edition), I came across 4 different ads that included some sort of enabling technology – technology that enables a static experience to become interactive. 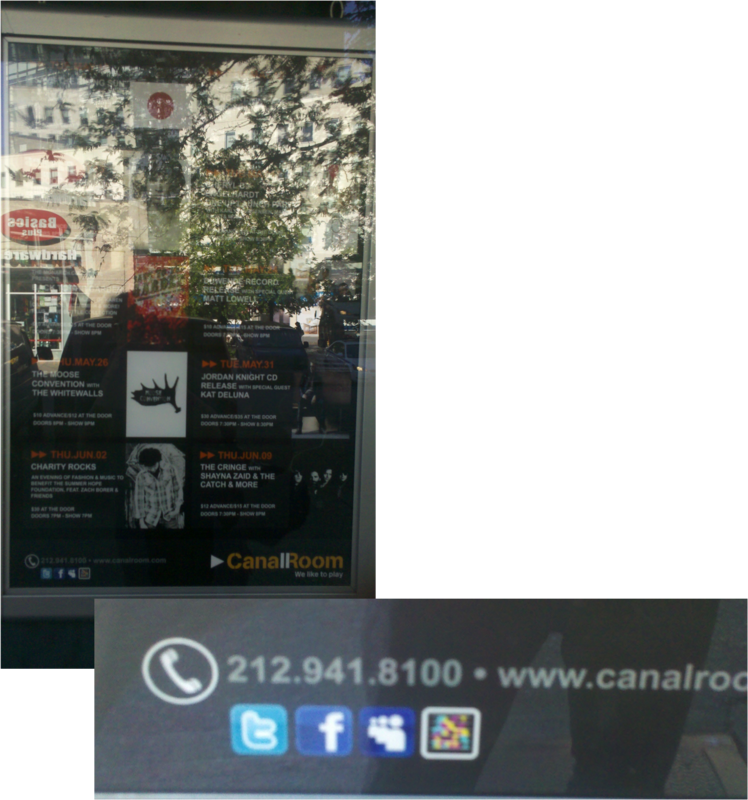 2 of the ads used QR Codes, 1 of the ads used a Microsoft Tag, and the other used Google Goggles. They’re all based on the same premise – bridging the offline (real-world) with the online (virtual world) – but technically, the technology is a little different – QR Codes and MS Tags are 2D Barcodes and Google Goggles is an image-recognition technology. It’s the difference between the information/content being stored in the code vs. in images in the ad. For all intents and purposes, I consider them both effective technologies in merging offline (non-digital) with online (digital). Interestingly, though, I think image recognition technology like Google Goggles would enable a better digital to digital experience. I’ve never understood putting a 2D code on a digital medium to drive to another digital medium. But if I could take a picture of the image on the originating digital medium to drive into another, ideally deeper digital medium/experience, I could see the value. Anyway, it was interesting to see so many different interactive ads in the same place and it allowed me to compare and contrast them in a way that didn’t seem so disparate (like others that I’ve done here). 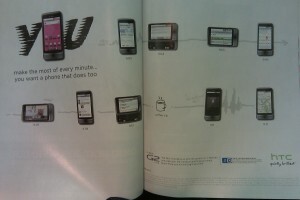 First, I should point out that I’ve never seen this many interactive print ads in the same publication to date. 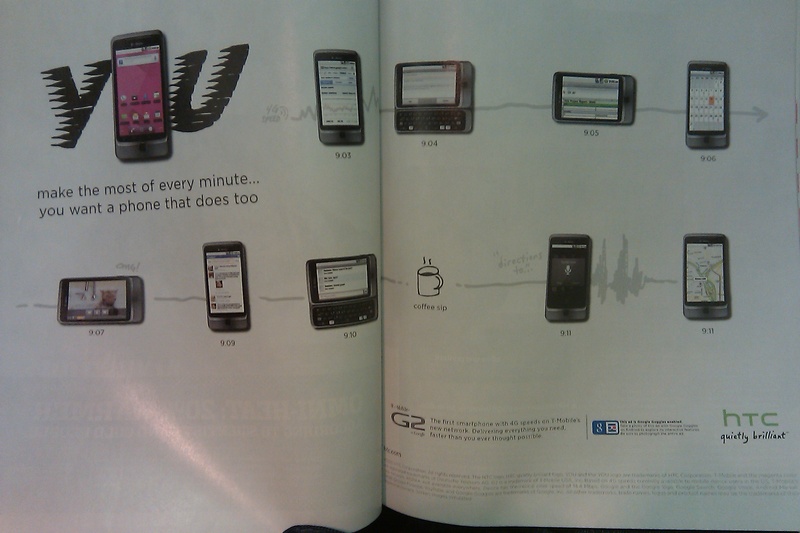 At the beginning of the year, you would’ve been hard-pressed to have found 1 interactive ad like this in 10 publications. As the year has gone on, it’s not unusual to find 10 publications with 1 interactive ad each (some brands are using these consistently in their print pieces – Ford and Asus, to name two). 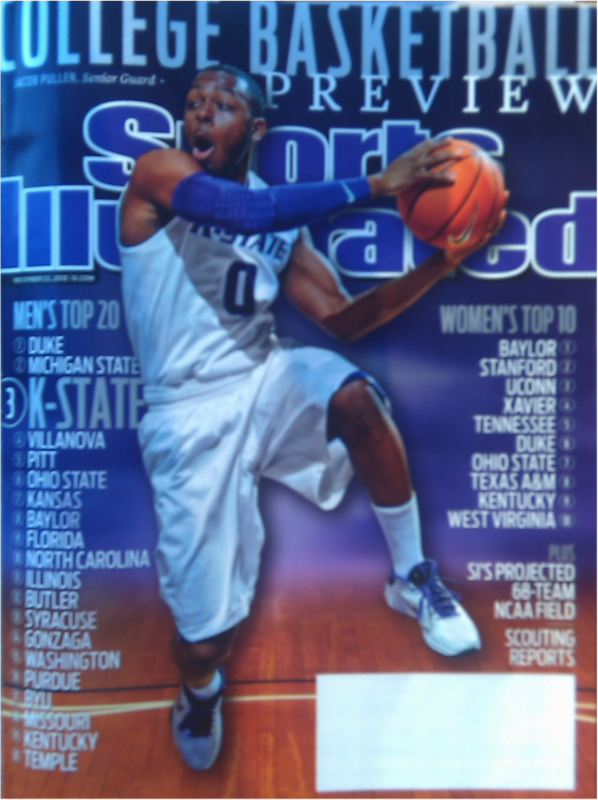 Over the past couple of months, I’ve noticed a couple in each publication, but never FOUR. I really think this trend is going to continue growing into next year and we’ll see the majority of these ads including some sort of technology like this that enables a deeper, interactive experience with the brand. It’s a no-brainer, in my opinion. However, I do think it’s going to force brands to think about the entire experience rather than just plopping a code onto their print pieces, as it seems is the case more often than not now. The brands who will be successful in using technologies like this are those who put the experience first and let it lead the technology vs. putting the technology first and letting it lead the experience. Overall, when looking at each of these 4 executions, it seems as if the latter is more of the case. Before I get into dissecting the experiences, I do think it’s important to acknowledge these brands for using these technologies. There are at least 20 other advertisers in this same publication who aren’t using anything other than a URL (if that) to drive consumers deeper into the experience. The catch here, though, is that consumers are smart – when they start using these technologies and scanning codes/images, if they don’t see value on the other end (it can come in many different forms – content, offers, coupons, connections, etc…), they’re going to equate them with being invaluable, and once that happens, it will be hard to change their behavior and get them scanning again. So, let’s get into it – the biggest consistency was the inconsistency. From the directions that they do/don’t give on the actual print piece to the site they send you to to the content on the site to the extensions beyond the site – none are the same. This isn’t necessarily a bad thing – no two brand experiences should be the same – but I do expect some level of standardization on what I believe to be elementary components of this type of experience. Let’s start with the ads themselves and two things right off the bat – 1) how prominent is the code/ability to know that the ad is interactive and 2) how clear and useful is the call-to-action/instructions? The 3 ads that include codes, you can clearly tell that they include something unusual-looking that you can probably do something with. (Unlike Stickybits, I think the form factor of both QR Codes and MS Tags are different enough that consumers stop and actually look to see what they’re all about. They might know that they have to do something with them, but they’re not exactly sure what they are and/or how to use them – this is a start. They know that they can take an action.) The ad that included Google Goggles, however, made it difficult to see that there was something interactive about it. Google’s Goggles logo is small and within the context of the ad, it gets lost. So, here, advantage to the 2D codes. But it doesn’t stop there. Perhaps the most important component of using this technology is the instructions. It’s simple people – don’t get cute with instructions. Say what to do and how to do it in the simplest, most clear terms. Don’t make consumers guess at what they’re supposed to do. Tell them exactly. There’s nothing useful about enabling interactivity if the user can’t figure out how to actually interact with it (same can be said for not knowing what to do with touchscreen experiences). I found all 4 of these to miss the mark on instructions, some a little less drastic than the others. Google Goggles was the clear winner here – their instructions were the closest to being simple and clear. “Snap?” “Snag?” “Icon?” Talk about colloquialisms. Why use fancy words when normal words will do? 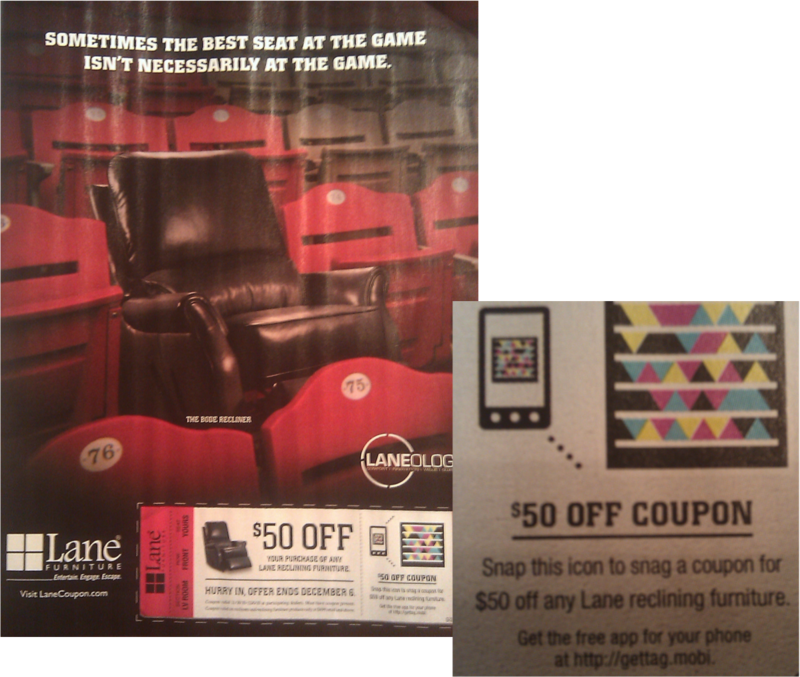 “Take a picture of the code for a coupon…” sounds much more clear and to the point, don’t you think? The other two – OnStar and Axe – failed miserably on the instructions. OnStar takes the casual language to the next level, to the point of being utterly confusing. For the experienced and savvy, this is beautiful. 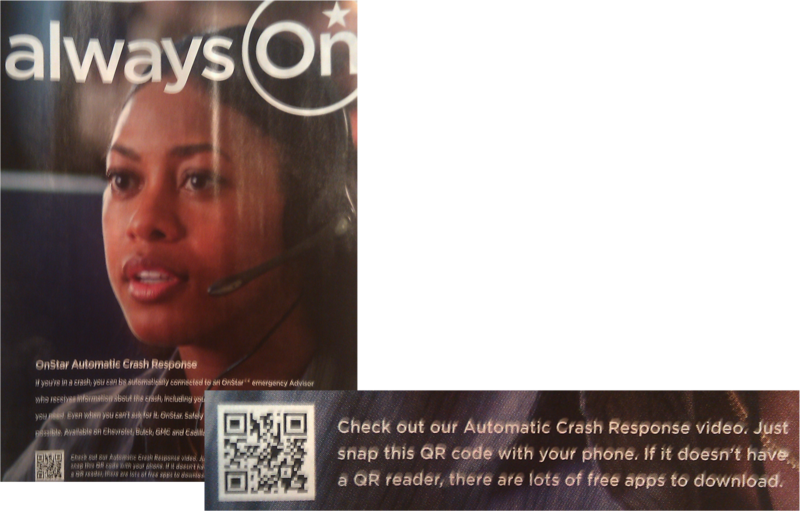 Only problem is that there is an ultra-minute fraction of consumers who are both experienced and savvy with QR Codes. I would bet that here, they’re likely just to use the URL to get to the video instead of scanning the code – that would be a great piece of data to see – when presented with 2 options like this, what do consumers tend to do? What do you want them to do? 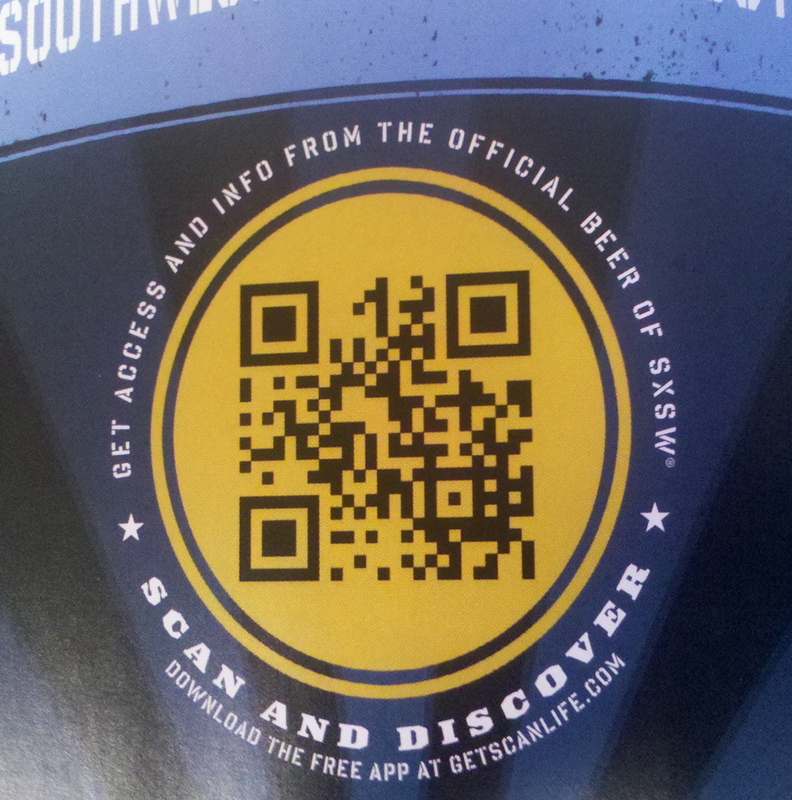 Yes, go to the website, but why put the QR Code on the ad in the first place unless you want them to scan it? I’m also of the mindset that this sort of technology can become extremely beneficial if it’s the gateway to something (content or offer) exclusive, only to be seen/accessed through this channel. If anyone can see the same content just by going to the website, I think it devalues the experience. So, now that we’re on content, let’s turn our attention to that which makes or breaks these experiences – the actual content behind the code/image. All of these 4 brands utilized video in their experience. Makes a lot of sense since video viewing on mobile is a) good and b) expected. I think it’s about the type of video that separates these experiences more than anything. 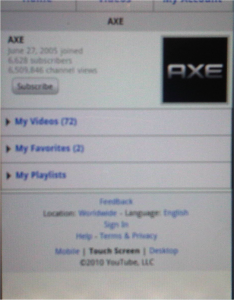 And here, Axe is the winner. The first video you see is an edgy, just-what-you’d-expect-from-Axe video. 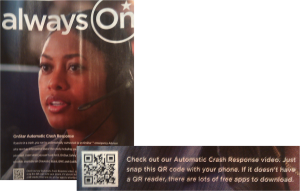 While the others – G2, OnStar, and Lane – included relevant video, there was nothing special about their content. 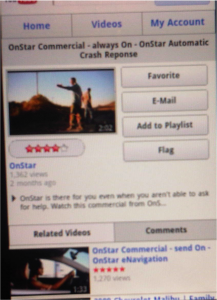 In OnStar’s & Lane’s case, I found the videos to be long, boring, and overall, not compelling. The actual site from which these videos originated from, and the experience through the code to get to the videos was another point of differentiation. On the positive side, they all sent me to a mobile version of a particular website, be it the product website or a YouTube channel. So, I didn’t have to futz around with navigating through a normal website experience on my mobile phone. 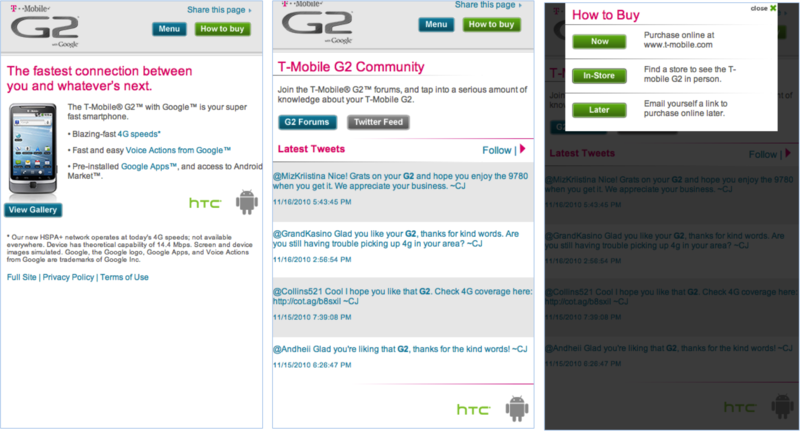 That said, the only experience I found to be substantial and complete was the G2 experience. It’s the same experience that I highlighted through another ad last week. It’s really as complete of an experience you can expect. The OnStar and Axe experiences, on the other hand, were not complete and honestly, pretty underwhelming. They both took me to a YouTube page where the experiences were similar. The only difference was that through Axe, they asked me to “Subscribe” to the channel first. It was kind of annoying, but from a brand’s standpoint, I think it’s a smart thing to do. It’s a different form of data collection and through the subscription, the consumer experience with the brand doesn’t stop after this particular experience. Every time a video gets uploaded to the channel, all of the subscribers receive a notification and in turn, go watch the video, and you’re they’re that much deeper in the brand’s experience. I think they could have done so much more, though (at the very least, included more of a clear social – other channels – extension). 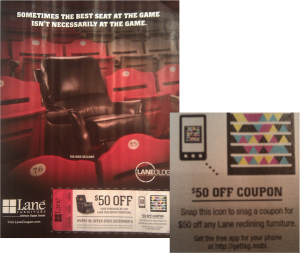 Lane’s experience included the ability to sign-up for a coupon (which is always a great enticement) via email and aside from the vague (in this case, absent) opt-in language, enables consumers to receive updates and information from Lane beyond this experience. The ability to find a store close to me. This is a simple utility that offers another channel (the right one, mind you) to drive consumers into the store. A mobile experience that is only a sub-set of their normal .com website. Consumers don’t need everything a brand offers on their website through their mobile device. Just the right things. Lane has done a good job here. I think it’s appropriate to say at this point, if you’ve made it this far in the post, THANKS. It’s the longest post ever. I didn’t want to break it up into 2 different posts because the opportunity to view (and review) this many experiences in the same setting hasn’t come along before and I didn’t want to separate any part of my thoughts. 2. Lane – their offline (on-page) call-to-action was clearer than the other 2 and their online (on-phone) experience was more valuable and simpler. 3. Axe – their experience was the most “on brand” but I expect more out of Axe, all the way around. 4. OnStar – just think they need to spend a little bit more time thinking through the entire experience and paying off their awesome service in a unique way – they can do some interesting things through these enabling technologies, given the capabilities of their own technology. Again, it made me happy to see so many in one place. I think there is much potential in this sort of technology. Most importantly, it allows for something that would have otherwise NOT been interactive or a 2-way engagement to be so. It’s opens up an entirely new communication channel. But as we can see here, most everyone has a long way to go to make a complete, compelling, valuable experience through this type of engagement. So, now that I have belabored this in more ways than one, I’d love to hear your thoughts. What do you think??? 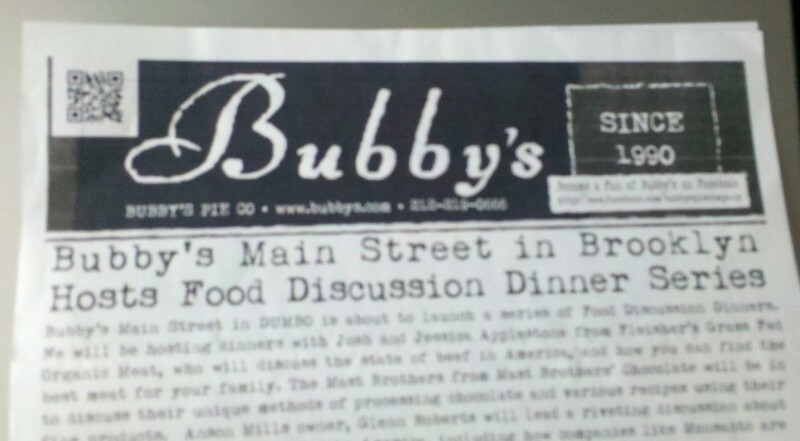 This entry was posted in Emerging Technology, Mobile and tagged enabling technology, Google Goggles, Mobile, MS Tags, QR Codes on 11/23/2010 by Mike Cearley. As I’ve said before here, I think technology has enabled what was once static to become interactive, particularly as it relates to the “OOH” channel, which up until recently has been a static, “offline” advertising and communications channel. On one hand, you have the digital display technology that enables those static ads to become digitized and as a result, more dynamic, relevant, and meaningful (digital signage). Those digital “screens” have become more efficient advertising channels for brands, and can even help push consumers along the purchase journey, depending on their placement in a particular environment. I don’t talk much about that kind of OOH here. In the coming year, I want to put more of a focus on it here, but that aspect of OOH has never excited me to the point that the other aspect has. Which is the other hand – on the other hand, you have various enabling technologies that enable those static ads to become interactive, and as a result, actually engaging. It’s the difference between a 1-way push message (the former) and a 2-way push/pull communication (the latter). One is passive. The other is active. It’s the active that really excites me. So, I’m always looking for examples that do just that – take what was once passive and make active through these enabling technologies. I’ve noticed many of these examples this year through print ads. 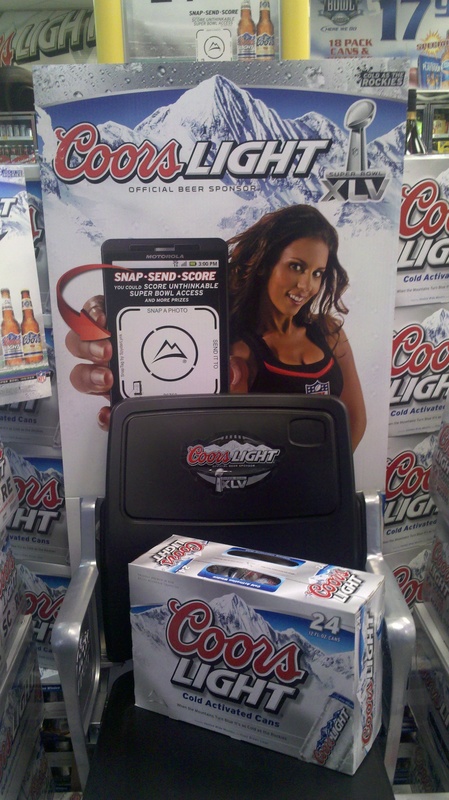 Whether it be QR codes or MS Tags, brands have really started experimenting with this type of engagement. By no means has it taken off, but it’s an easy technology to include from a production standpoint, so I suspect to see the trend continue to grow slowly in the coming year. I think we still have a ways to go to reach critical mass, but the consumers who actually recognize these codes and take a picture of them have the opportunity to engage with the brand in a way that they wouldn’t have had otherwise. 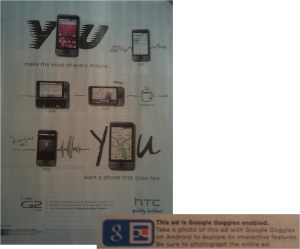 I came across another such technology in this month’s Wired – Google Goggles. I learned about Google Goggles earlier in the year, and as an Android smartphone owner, it was one of the first apps I downloaded. But I haven’t ever had success with it until now. 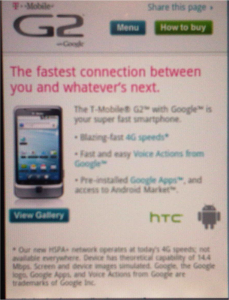 HTC “enabled” their most recent ad with Google Goggles. If you’re not familiar with Google Goggles, it’s an image recognition technology that enables you, as a user, to snap a photo of a variety of things – landmarks, logos, print ads to name a few – and then learn more about them through mobile web without “searching.” As with other image reading technologies (like the aforementioned codes), it’s designed to be a convenient way to get information you want about anything in the real world. They’re an ideal technology to bridge the offline (real world) with the online (virtual world). They have designed this experience to mirror an effective e-commerce site and aside from the Microsoft mobile site I recently experienced, this is the best I’ve seen through any technology like this. Before I posted this tonight, I came across a Tweet that led me to an article in Fast Company – “What Google Goggles Will Do for the Ad Industry.” The video really says it all. Agree with everything everyone said here, but I don’t think the only answer is Google Goggles. Like I said, up until now, I haven’t had a good experience with the application. It’s had a hard time reading the “real world item” and I’ve found QR codes/MS Tags to be more responsive, and ultimately convenient. The one thing about Google Goggles is that it is designed to enable to “wordless search” via image recognition – what happens if you’re a brand and someone takes a photo of your product and through Goggles is taken to a Google search where right there in the first listing is a bad review? 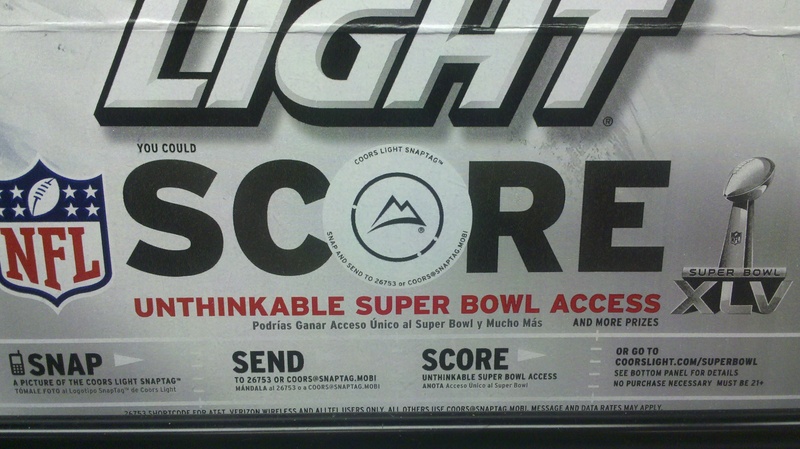 It seems like there are elements of the openness of this that could work against the brand instead of for them. What do you guys think? Have you used Google Goggles? I would love to hear about your experience, if so. 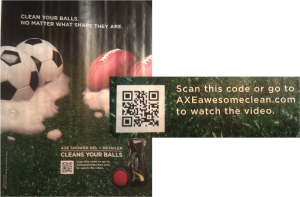 This entry was posted in Emerging Technology and tagged Google Goggles, MS Tags, offline to online, OOH, QR Codes on 11/16/2010 by Mike Cearley.